(1) The list of selected candidates published by the Commission in pursuance of this notification shall remain in force for a minimum period of one year provided that the said list shall continue to be in force till the publication of a new list after the expiry of the minimum period of one year or till the expiry of three years whichever is earlier. Candidates shall be advised for recruitment from the list prepared in pursuance of this notification against the vacancies reported to the District Officers of the Commission during the period of currency of the said lists. In case no candidate is advised from the list till the expiry of the period of 3 years, the duration of the list shall be extended for a further period of one year or till at least one candidate is advised from the list whichever is earlier. (2) 3% of the vacancies reported to the Commission for the above post shall be reserved for appointment of Physically disabled persons, limited to the categories of Low Vision , Hearing Impairment and Locomotor Disability/Cerebral Palsy as per G.O (P) 1/13/SJD dated 03.01.2013. A separate list of such candidates shall be prepared along with the Ranked List (Physically disabled candidates must enter the details in the Declaration Link and Weightage Details Link of their profile). They shall be advised against Sl.No. 33, 66, 99 in a cycle of 100 fresh vacancies as per rules. Physically disabled candidates included in the Main list/Supplementary lists for reservation communities shall also be included in the list prepared exclusively for them on the basis of merit. If candidates in the list (Main list/Supplementary list/List for PH) is advised from any one of the above list on Open/Reservation/PH quota, the name of the candidate shall be deleted from the other list(s). Relaxation in age and award of Grace marks will be given to the Physically disabled candidates as stipulated in the existing Acts & Rules. (3) Candidates who are eligible to apply for both Direct Recruitment and Recruitment By Transfer need not select the same district for both categories. But they should submit separate applications for each category even if they selected the same district. Candidates who are already included in the Ranked list for By Transfer Recruitment in any one district are not eligible to apply for By Transfer recruitment. Candidates who are included in both lists under this notification and advised from anyone of the lists shall be deleted from the other list as per Rule 18 (iii) of the KPSC Rules of Procedure. (4) Candidates advised as Lower Division Clerk/Village Assistant in the Revenue Department from the Ranked List to be prepared in pursuance of this notification will be sent by the Department for Survey Training if they have not already passed Chain Survey Test. (5) Selection to this post will be made on the basis of a Competitive Test of the SSLC Standard. (6) Candidates willing to be posted as Lower Division Clerk in Kerala State Archives Department must submit willingness. Such candidates are eligible for appointment in other departments also, as and when their turn for recruitment arises. If a person is once advised for appointment in the State Archives Department, he will not be further considered for appointment in any other Department on the basis of that select list. Persons appointed as Lower Division Clerk in State Archives Department have to undergo during the period of probation, an Inservice Training in “Old Scripts” as may be prescribed by the Government. (7) The selection test will be conducted at different centers in each district (The name of the Examination Centres will be published later). The candidates should appear for the examination wherever they are admitted. As the selection is District wise, candidates will be allowed to appear for the test only in the examination centres for the District, which they have opted in the relevant column of the application. Candidates should be present at the examination centre on or before 1.30 pm on the date of examination. Candidates who failed to do so will not be permitted to attend the examination. (8) The selection in pursuance of this notification will be made on district wise basis, subject to the special conditions laid down in G.O. (Ms) No.154/71/PD dated 27.05.1971. A candidate advised for appointment in one district from the Ranked List prepared for that District is not eligible for transfer to another District for a period of 5 years from the date of commencement of regular service in the former district. Even if transfer is allowed after 5 years, it will be subject to the rules in G.O. (P) No.36/91/P&ARD dated 02.12.1991 for inter district transfers in same Department and G.O. (P) No.5/2013/P&ARD dated 06.02.2013 for inter departmental transfers. But as per G.O. (P) 12/96/P & ARD dated 16.03.1996, the condition of 5 years service is not applicable for the transfer to the Districts of Idukki, Wayanad and Kasaragod. This concession will be available only for getting transfer in to these districts, but not for getting transfer out of these districts and this concession will be granted only once in the career of a Government Servant. Candidates already in Government Service holding the post in any one district are prohibited from applying for the same post in another District. (9) For appointment in the Head Quarters vacancies no separate option is necessary. They will be considered for appointment in the head quarters vacancies also without such option. Vacancies arising in the Head quarters will be filled up according to the terms and conditions of G.O. (Ms) No 154/71/PD dated 27.05.1971, commencing from Thiruvananthapuram District. applicants should obtain a service Certificate from the Head of the Department or Office showing their length of service and service to which they belong and produce the same as and when required by the Commission. 8. Last date for receipt of applications:-28/12/2016 Wednesday up to 12.00 Midnight. 9. 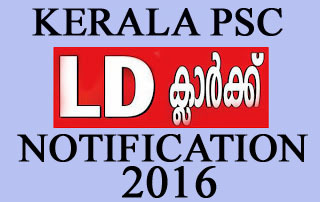 Mode of Submitting Application:-Candidates shall register as per 'ONE TIME REGISTRATION ' system on the Official Website of Kerala Public Service Commission 'www.keralapsc.gov.in' for applying for the post. Candidates who have registered shall apply by logging in to their profile using their User- ID and password. Candidates shall click on the 'Apply Now' button of the respective posts in the Notification link for applying for a post. No application fee is required. Candidates can view and have a print-out of the details in the profile by clicking the link Registration Card, if required. Candidates are responsible for the correctness of the personal information and secrecy of password. Before applying for a post, candidates must ensure correctness of the information in their profile. They must quote the User- ID for further communication with the Commission. Applications once submitted will be received as provisional and particulars shall not be deleted or altered after submission. Applications submitted not in accordance with the conditions of the notification will be summarily rejected. Documents to prove qualification, community, age etc. have to be produced as and when called for .